Water is essential in a bird-friendly yard, and a fresh, clean bird bath can attract birds that won't visit feeders and aren't interested in birdhouses. Even the best bath won't be of much use to birds if it is in the wrong place, however, and poor bird bath placement can not only be unattractive, but even dangerous to birds. Most birders assume that any bird bath is helpful, but in the wrong place, a bird bath can actually hurt birds. Positioned under a feeder or near a tree or bush that regularly sheds its leaves, a bird bath will soon fill with dirt and debris that can foster mold or bacteria growth that can cause disease. Bird baths too close to windows could lead to collisions and injuries, and a bird bath that is accessible to predators puts birds in harm's way whenever they drink or bathe. Fortunately, it is easy to choose the proper bird bath placement to maximize the bath's usefulness and minimize its hazards. No two yards, landscapes, or gardens are the same, and it can be difficult to decide where the best place to put a bird bath may be. By considering different factors, birders can evaluate their yard's layout and local birds' needs to choose the ideal placement. Size: The size and weight of the bath are critical when choosing placement. A heavy concrete bird bath will be difficult to move and could damage delicate plants or sink into soft soil. A smaller, lighter bath, on the other hand, needs shelter from strong winds that may cause tips. Climate: Local climate and seasonal changes will influence the best place for a bath. In northern areas, a sunny spot may be best so sunlight can help keep the water warmer on cool days and even help keep water liquid in winter. In southern regions, however, a shady spot keeps water cooler on the hottest days and helps minimize bacteria growth in warm water. Stability: Bird baths should be placed in level, safe areas where they are not likely to tip, fall, or spill easily. The basin should be as level as possible to keep the depth even and maximize its water capacity. If necessary, use gravel or paving stones beneath the bath to help level the ground and provide a stable surface. Visibility: Birds won't use a bath they can't see, and birders won't enjoy the bath if they can't see birds using it. Choose a location that offers decent views for watching birds and is easily visible to birds in other parts of the yard so they will notice its availability. Cleanliness: A good bird bath position will help keep the water clean. Avoid putting baths beneath trees or shrubs that liberally shed blooms, seeds, or fruits. Similarly, keep baths several feet away from feeding areas to keep spilled seed, hulls, or feces from accumulating in the water. Water Source: The closer a bath is to a hose or spigot, the easier it will be to keep clean, fresh, and full. If the bath must be further away from a water source, be sure any hoses are long enough to reach and pitchers or buckets are easily accessible for refilling the basin. Windows: While a bird bath close to a window will be easy to see, splashes on the glass can quickly leave a dirty residue that can be aggravating to keep clean. If the bath is too close to a window, birds are also at greater risk for dangerous collisions. Ideally, place a bath several feet away from any windows so birds have adequate room to maneuver but the bath is still easily visible for convenient watching. Shelter: Birds are nervous when they drink or bathe, and if a bath is too exposed, they are less likely to use it. Position the bath near a bush or tree that birds can escape to if they feel threatened, but do not put it so close that predators could easily hide and attack the birds. Bath Design: Some bird bath designs have special requirements for placement. A solar bird bath, for example, needs to be in full sunlight to function properly, while a bird bath fountain must be near a power source or it will not work correctly. With so many factors to consider for proper bird bath placement, it may be impossible to find one perfect location that suits the bath exactly. Instead, compromise on different factors to find the best possible place, but always keep birds' best interests and safety in mind. Birders can easily take steps to make the most of every bird bath and to make each one attractive and inviting to birds. Place a bath in a garden or flowerbed where splashes and spills can help keep plants watered and conserve water use. Be aware that bird feces can accumulate around a bath, however, which can change the soil's acidity and make it less suitable for some delicate plants. Opt for partial or dappled shade to help regulate the water temperature. This will also create changing shadows and sparkles on the water's surface that can help attract birds as they notice the water. Keep the bath out of reach of pets and children, not only to keep the birds safe, but to prevent exposure to feces, bacteria, algae, and other materials that may be dangerous. Position the bath under a gutter or downspout, or in reach of automatic sprinklers that can help keep the water moving and keep the basin more easily refilled. Use multiple bird baths in different locations to meet birds' different needs for bathing and drinking and attract even more species. Just as it can take time for birds to discover a new bird feeder, birds will not necessarily flock to a new bird bath as soon as it is filled. By positioning the bath in a safe and attractive location, however, it is possible to encourage even more birds to use it, and birds and birders alike will get years of enjoyment from the bath. 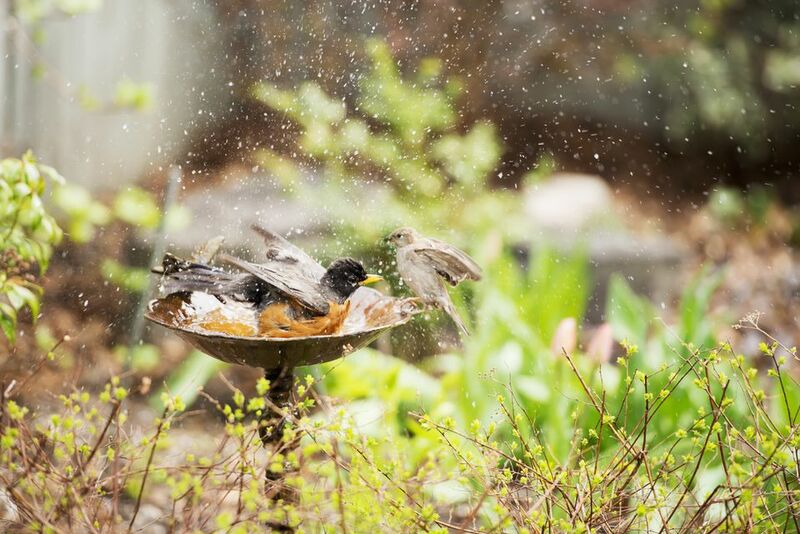 What Is the Best Bird Bath for You?